1. Place all the ingredients in a blender and whizz until smooth and creamy. Pour into tall glasses and serve. 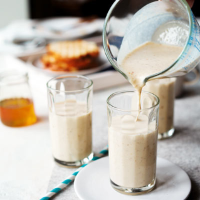 Using the basic ingredients of oats, banana, apple juice and yogurt, you can ring the changes by adding blueberries, strawberries, mango or pineapple.